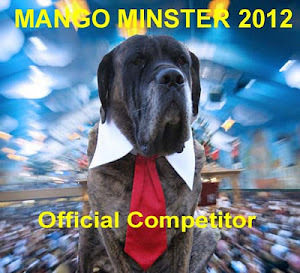 Dog Training is very important – it teaches us how we are expected to behave. Vikki believes that my training isn’t about imposing will, force and fear. 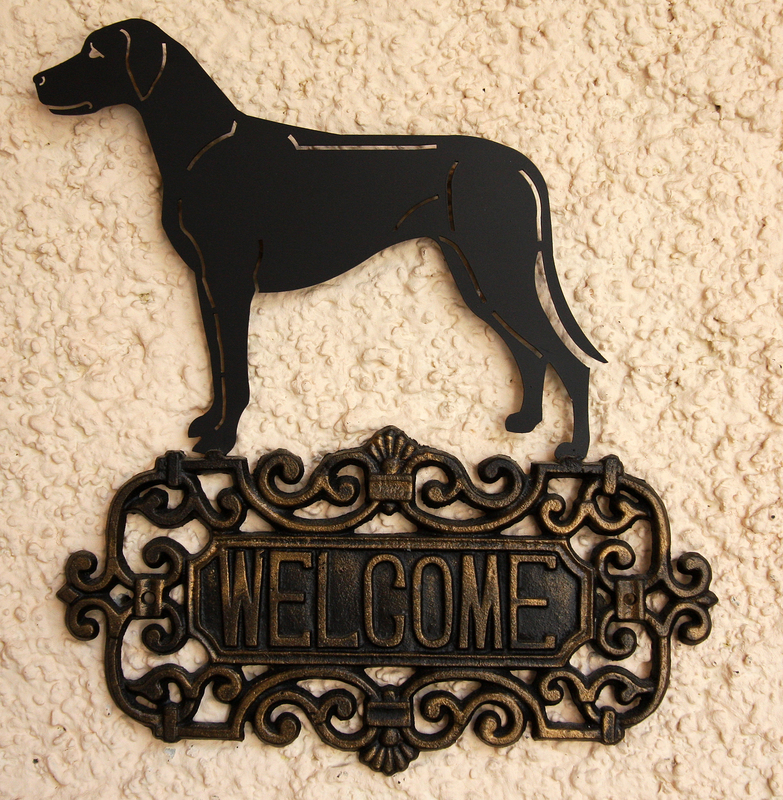 Its about giving me the tools I need as a Rhodesian Ridgeback dog to live in the human world – where I know in myself what the good behaviours are. This style of dog training encourages me to actively participate and want to learn, especially when learning = fun times, yummy treats and rewards! Training should set me up for success! Vikki uses positive reinforcement training techniques not just because it suits the Rhodesian Ridgeback breed much better, but also because it is more natural to her and the type of person she is. She does not want to get all stressy and march around with a raised voice forcing her will on me in order to correct me. She would prefer to encourage and ‘shape’ my behaviour with the use of positive signals (the clicker/ praise) and reinforcement (food treats/ praise/ toy). It’s a hands-off, no-force training technique for anyone who doesn’t like the jerking, pulling and pushing around of old-fashioned dog training methods. She does not wait for me to do something wrong so that she can tell me off (corrective old-fashioned method), instead she praises the things that I do correctly and sometimes gives me a reward (yummy treat). Whilst learning new skills, I am more likely to repeat a good behaviour with praise and treats. 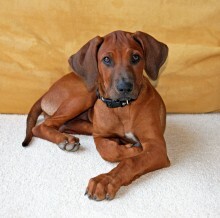 “Rhodesian Ridgebacks look very strong and elegant but behind the unwavering stare there is a huge sensitive soul.” This sensitive soul is so intrinsic to my breed that Francis R. Barnes, who wrote the original South African standard, commented on it more than 75 years ago. “Rough treatment should never be administered to these dogs, especially when they are young,” he advised “They go to pieces with handling of that kind”. Forceful handling with commands can send a us Rhodesian Ridgebacks into a tailspin, especially from someone we do not know..or more importantly – trust. If a human has true understanding of my breed, he or she knows how to build trust and how to negotiate with us to arrive at the same place together, both literally and figuratively. Someone who understands how dogs learn so that the we grow up to be a well-balanced, model canine citizen! Someone who respects and admires our intelligence & independent nature and is willing to work **with** it, not against it. Someone who loves to play our kind of games…the games with a big sense of humour. This way it’s so easy to have fun, a happy waggin’ tail and laughter! Perhaps if humans learn and read more about how dog learns, how they communicate and their body language and what their dog needs for good mental and physical wellbeing – every dog would be set up for success. Everywhere we go is a learning environment and Vikki tries to integrate learning with fun. She might drop a few treats for a trail in the forest or we may do some log jumping and then I have to sit and stay for a while. 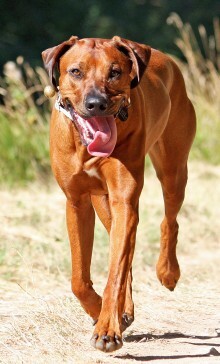 Rhodesian Ridgebacks are real jokesters so learning through fun, games, praise and yummy rewards really suits us.